We're glad you stopped by. 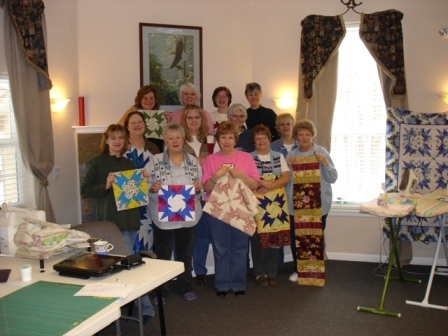 We love to exhibit customer quilts and photos of special events and happenings at High Country Quilts on our Gallery page. Send us a photo by email (hcq@hcquilts.com) OR snail mail of your latest quilt and a brief description and the story behind the quilt (there usually is one). 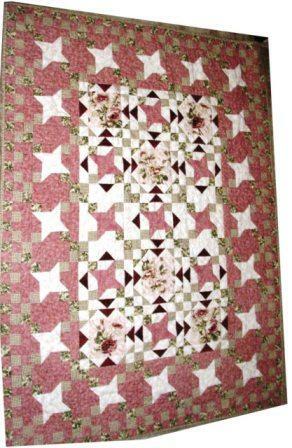 We also enjoy seeing all the gorgeous quilts that customers bring in to show us at the shop. 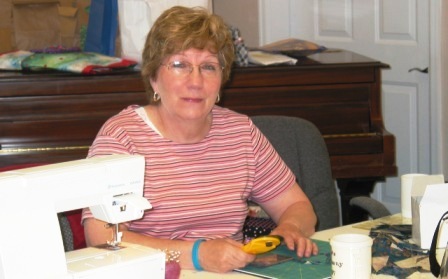 We are amazed at how much quiltmaking gets done by so many busy women. HCQ'S 2007 SHOP HOP QUILT "TUMBLEWEEDS"
We just love the way the red, white, blue, and gold turned out on our version of the Shop Hop quilt. 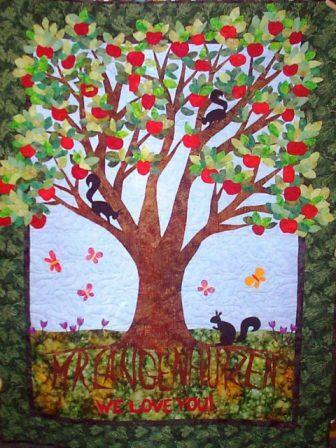 The quilt pattern was designed by Debbie Cafferty and long arm quilted by Valerie Campbell of Lone Tree Quilting. 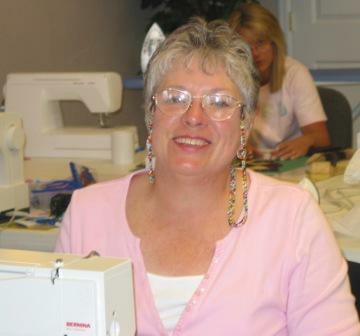 You can get Valerie's contact information on our Long Arm Quilting page. 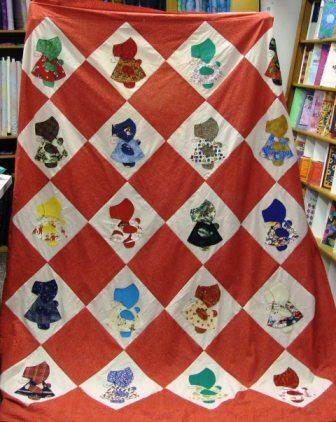 Our good quilting friend, Deb Kalkman, brought in another new accomplishment--her Sunbonnet Sue quilt that she pieced for a friend who lost many of her possessions in a fire. 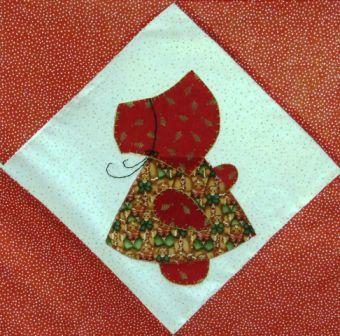 It has a vintage look even though Deb used some modern novelty prints to dress her Sunbonnet Sues. We had to take a picture of one of the Sues to show you the cute details (shown above). 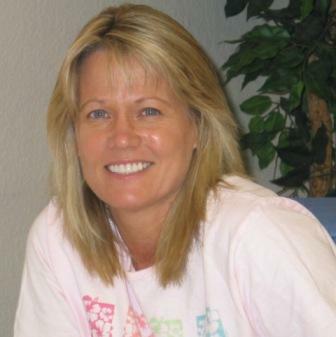 Way to go Deb! 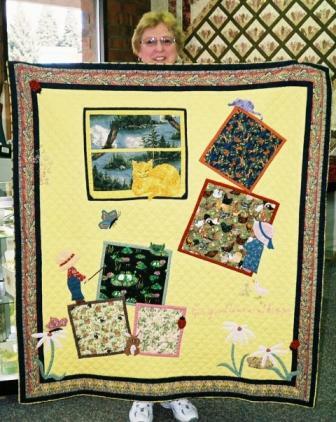 Mary Henning emailed us this photo of her mystery quilt that she made for her sister's birthday gift. 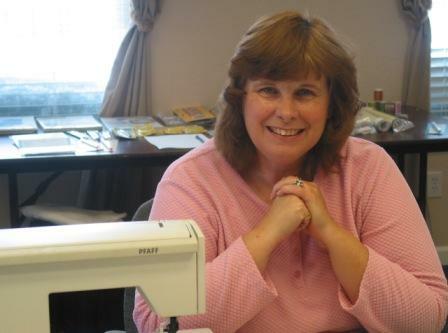 She came to HCQ looking for fabrics for the quilt and Karen and Natalie suggested one of Maywood Studio's Willowberry Lane fabrics for the focus fabric and then it was all downhill from there, according to Mary, picking out the other seven fabrics for the quilt. 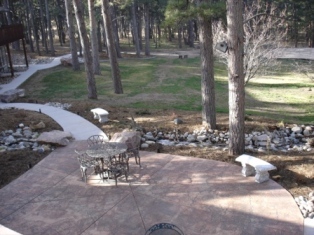 Mary, it turned out great and thanks for sending in your photo! 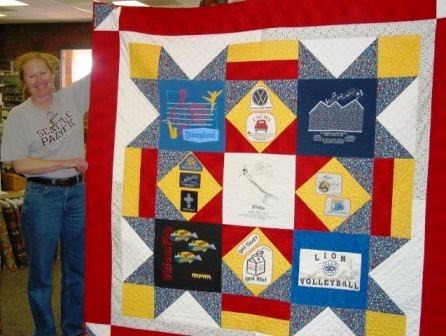 Lisa Coyle made this quilt for her children's school principal for his retirement at the end of the school year. Thanks Lisa for bringing in your wonderful quilt for us to see. 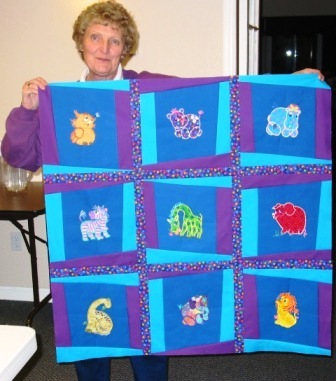 Wilda Worth came into the shop in May and showed us the quilt that she designed especially for her Granddaughter. 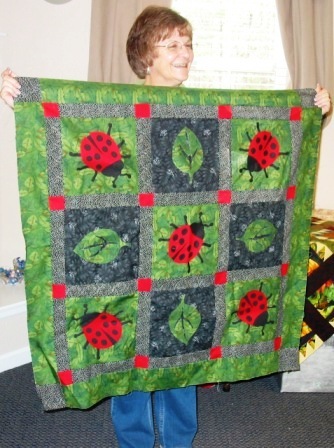 It's her own unique design filled with all her Granddaughter's favorite things. It is such a special quilt! 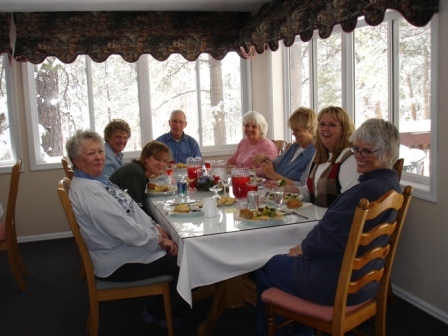 Our Mystery Quilt Retreat at The Hideaway in Black Forest, April 16-18, started off looking like a spring retreat this year! 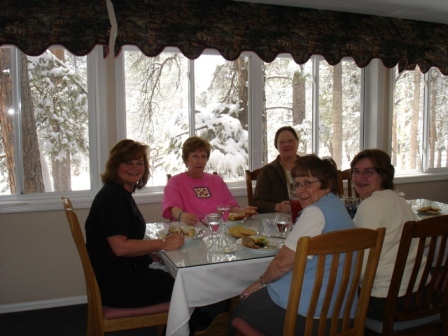 Watching the snow outside made it all the more cozy inside while we were quilting. Everyone was hard at work! The food was delicious and the company was even better! Look at all the beautiful projects! P.J. is showing the first step to our mystery pattern! 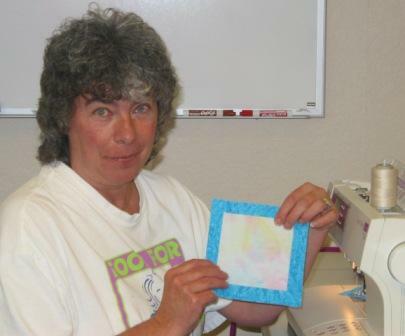 Anne had a lot of UFO's she wanted to work on. Way to go, Anne! We all had plenty of room to spread out and we needed every inch! Jean is trimming up her block. She choose beautiful batiks to work with! Doesn't Barb look pretty in pink? We all had such a good time, it was hard to find anyone without a smile on their face! P.J. is showing off her block. She was the 1st to complete a star! Tracy is taking a break, looking at everyone else's project. We had the most beautiful quilts! 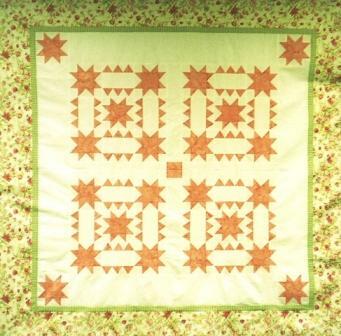 Linda's quilt was really scrappy in blacks and whites. It looked wonderful and what a great way to use up your stash! 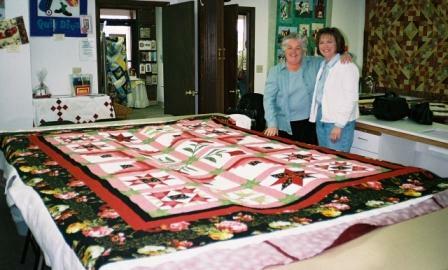 Jean and Natalie up all night long quilting? No actually, Jean minded the shop but couldn't resist spending a little time with us after she closed for the evening! We had the most wonderful show and tell time! 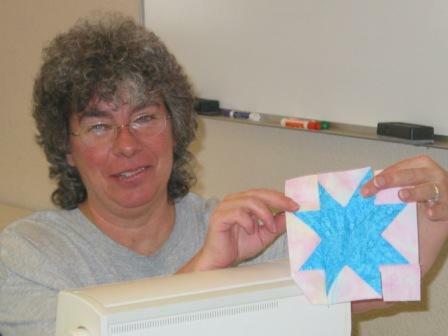 This is Cheryl showing off a quilt she had just finished. Isn't it striking? 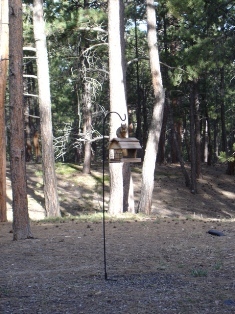 Here is another one by Cheryl. Natalie's Scrappy Bear's Path is lying on the table in the background! We all loved this one too! 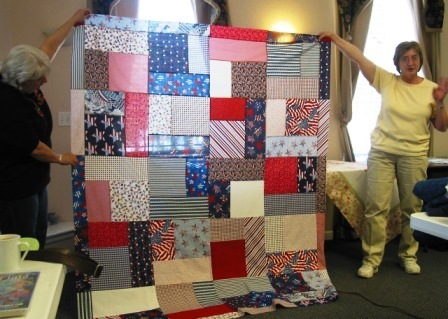 Pat's quilt was wonderful in red, white and blue! Then Pat shared these great placemats with us! What fun! 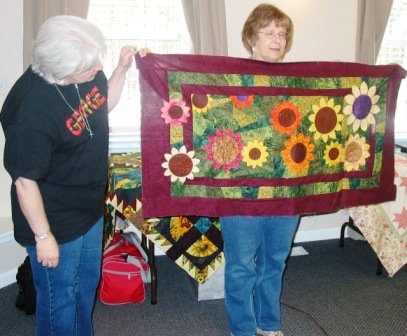 Jean Rebello (left) and local long arm quilter, Valerie Campbell, admiring Jean's Hidden Star Sampler quilt that Valerie just finished quilting. 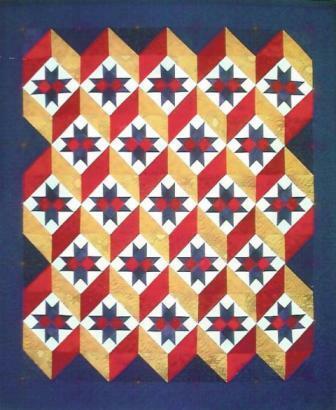 Jean Rebello's Hidden Star Sampler quilt. 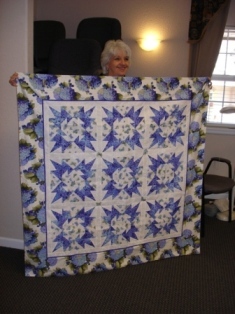 Jean took the Hidden Star Sampler class at HCQ and had her quilt quilted by Valerie Campbell. 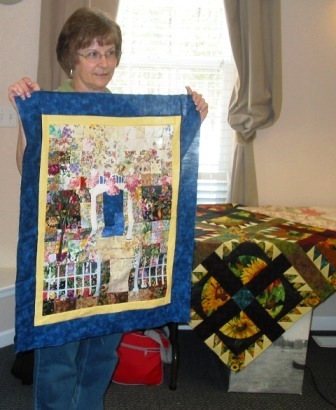 Quilting friend, Janet Wermel, standing proud with her T-Shirt quilt that she made for her daughter. You go girl! 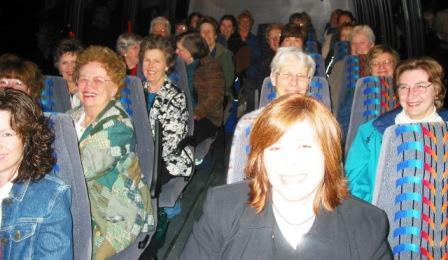 HCQuilters on the bus at 6:30 a.m. on the way to LaVeta to participate as a studio audience at Alex Anderson and Ricky Tims' new QNN quilting show called "The Quilt Show". 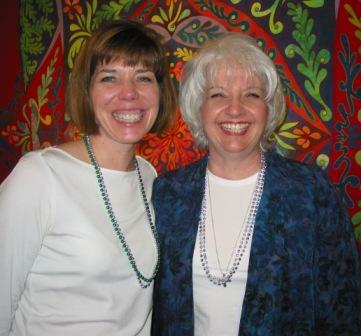 High Country Quilts owners, Jean and Karen, enjoying the LaVeta Bus Trip! 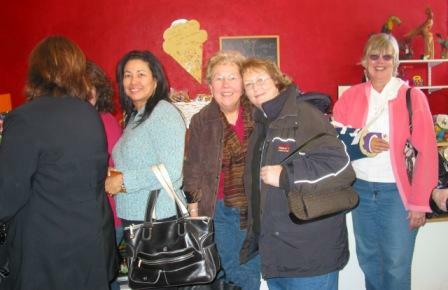 All of the HCQuilters about to head home after shopping at a quilt shop in LaVeta. Left to right: HCQ owners, Karen, Natalie, and Jean proudly showing off the three Quilt Pink quilts created by HCQ quilting friends and the HCQ owners and staff. 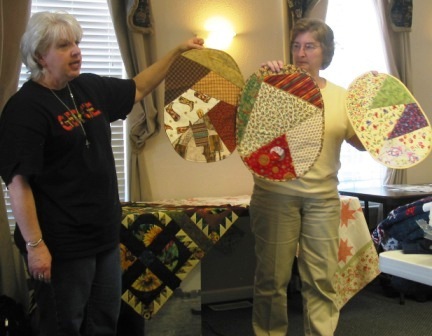 These quilts were shipped off to "American Patchwork and Quilting" magazine to be auctioned off with Quilt Pink quilts from all over the country. Quilts left to right: This 50" x 63" quilt features sunbonnet sue blocks, handkerchief, embroidered, appliqued flower, and a very unique pink flamingo block. Natalie is holding a Hearts to You block quilt (52" square) while Jean's quilt is a pink and red Nine Patch quilt (46" square). Thanks again to all of you who helped make these quilts a reality! 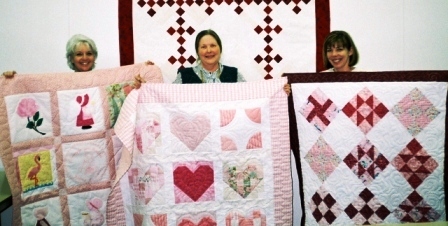 Over 4,000 quilts were created and donated to the Quilt Pink effort when it had been estimated that about 1,000 quilts would be donated to the cause to raise money for breast cancer research (Susan G. Komen for the Cure). 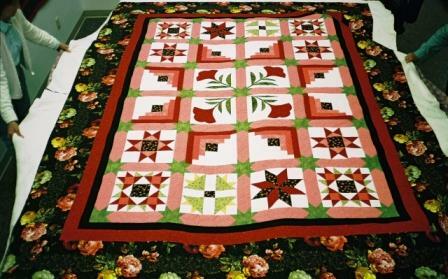 The auction features weekly auctions of approximately 150 quilts per week beginning and ending on Thursdays and totals nearly 4,000 handmade quilts that showcase the talent and hope of quilters to unite in supporting a cure for breast cancer.